This yellow-colored carrier oil has a golden touch on skin. Easily applied and absorbed, apricot kernel oil is used in bath products, makeup, perfumes, lotions (7), massage oils, body butters and lip products (8). The lightweight oil resembles the body's naturally-produces oil sebum. Often compared to avocado, olive and sesame oils (1), apricot kernel oil can substitute mineral and almond oils (1, Page 101). Its fatty acids act as emollients to nourish dry skin (1) and its vitamins rejuvenate skin's softness and elasticity (8,6, 1,11,9). 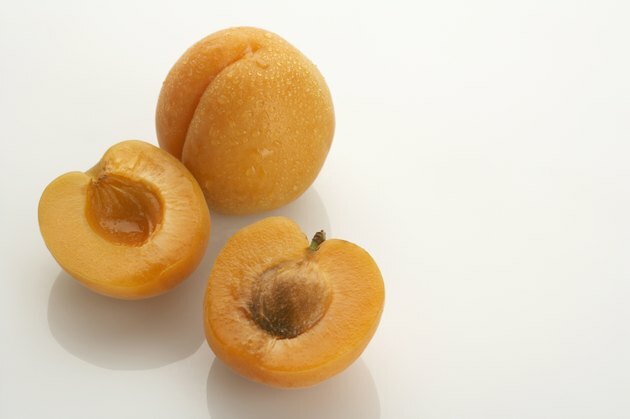 Apricot kernel oil acts as a non-greasy emollient (1). Its high amounts of essential fatty acids maintain the balance of moisture and fill in gaps between skin cells to leave skin silky and hydrated (4). Slather this salve over your body to revitalize your rind; oleic, linoleic and linolenic acids (11) are friendly fats that fight off acne, inflammation and dryness while locking in moisture. Count on the oil's linoleic acid to strengthen the skin's barrier function and oleic acid -- a common emollient and emulsifier in cosmetics (5) -- to soften for a satin-like feel and downreaching heal (14). This carrier oil quickly absorbs into the body (1). As an occlusive (12), it seals in moisture to reveal soft, dewy skin (1). Its vitamin-A content helps lubricate and heal skin (13), leaving it supple and silky. Apricot kernel oil passes deep into the skin to restore skin cell membranes (13, page 35) and provide long-lasting hydration and relief. Its flock of fatty acids nourishes dry, sensitive and scaly skin (1) and easily removes oil-based cosmetics: Instead of scrubbing skin with water, use apricot kernel oil to dissolve dirt, oils and makeup residue while continuing to soften (10, page 59). Youthful skin can be easily attainable: Think E for elasticity. This oil's high dose of vitamin E boosts the skin's ability to retain elasticity and clarity (1). Antioxidant vitamin E combats free-radical damage and inflammation (2). The oil's unsaturated fatty acids (11) enhance elasticity by making cell membranes more flexible (3). Think C for collagen; the oil's antioxidant vitamin C promotes collagen production, which gives skin extra stability and suppleness (9). Vitamin C, alongside vitamin E, also masks aging marks by reducing fine lines and wrinkles (13). Similarly, the vitamin A in apricot kernel oil repairs UV-related skin damage and smooths skin to reduce wrinkles, fine lines and rough skin (12). What Are the Benefits of Using Kukui Nut Oil? What Are the Benefits of Using Grape Seed Oil on the Face?